We are having a temporary electricity connection fitted next week (coffret de chantier) and need to know what size wire (mm2) to use to connect the coffret to the temporary fuse board (tableau). Any help would be appreciated. Also, our new fosse will be fitted in July along with a pump to raise the water from the bottom of the sand filter to enable it to empty into the communal fosse. Again what size wire and also what size fuse (disjoncteur) will be required for the pump. Branchement provisoire: for a precise answer distance, your puissance souscrite (how many amps), single phase or three phase should be taken into account. So only a few general remarks. A summary of the ERDF. Wiring to the tableau: see this table. Translation from Dutch: draaddikte = wiring size. 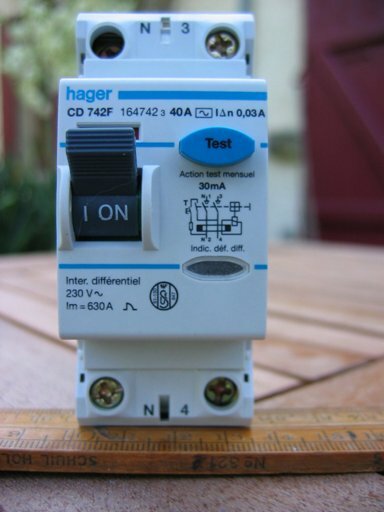 Translation from French: courant assigné = max current of the main switch fitted, the disjoncteur de branchement. BTW: you'll need also a piquet de terre close to your coffret de branchement provisoire, earth connection. And an interrupteur différentiel. Wiring + fuse for pump. See this table. Translation: zekering = fuse = fusible. Automaat = MCB = disjoncteur.